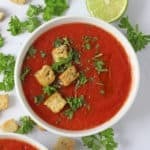 A delicious and refreshing no cook tomato soup ready in less than 5 minutes. The perfect lunch for busy parents this summer! Rougly chop the tomatoes, cucumber, red pepper and onion and add to the blender along with the garlic, lime juice, cumin and paprika. Blitz until smooth and then taste and season with salt and pepper. Add the ice and blitz again until it’s completely crushed. If it is too thick then add some cold water and blitz again until it reaches your desired consistency. Serve immediately. The toppings are optional. This soup is best served immediately but it will keep in an airtight container in the fridge for up to 48 hours.